I find that I am rarely successful at sharing all I wish to share with you here in Bill of the Birds. This is especially true after a long and wonderful trip to some birdy place. There's far too much to show and tell and not enough time to do it all justice. So here, below, I'll share some images and comments from our recent New Mexico sojourn. Can you spot the burrowing owl in this frame? Taken in the I-25 cloverleaf north of Socorro, NM. Loggerhead shrikes flash like black-and-white pinwheels in flight. This one is from the road to Magdalena. My tribute to Ansel Adams--a color image so underexposed that it looks like AA's black-and-white. This is the roiling Rio Grande near Manby Hot Springs. Gray-crowned rosy-finches from Sandia Crest near Albuquerque. I had all three rosy-finch species there--two of which were AOU split-lifers for me. Liam meets a yak near the Lewis' woodpecker colony. They talked about Lightning McQueen. Phoebe, sprite of the desert spring, contemplates life atop a shaded boulder. Photo by C. Quine. High desert road in predawn light. We can see the torn-paper shapes of distant mountains, but the road's course is obscured. Just got a new FANCY camera--one good enough to take actual, publishable bird photographs. It's a Canon 30D with a 300mm lens and yes, it ROCKS! Still have a ton to learn... but fortunately this camera has a setting called IP. This stands for Idiot Proof, which is like an AUTO setting for photography challenged blokes like me. Here (above) one of my first images, taken in the side yard, near the feeding station. I can already hear the siren song of the monster 800mm lenses calling my name....Biiiillll! Buy meeeee! Your kids can work their ways through college! The bank will understand about your mortgage payment! You will be a famous bird photographer! Biiiiiillllll!! After I took its picture, this tufted titmouse sang: peter! peter! peter! *#%! @ paparazzo! To my digiscoping compadres out there, no, I am NOT turning in my digiscoping permit. Digiscoping and birding are mutually compatable. Birding and taking photos with this new Canon are mostly mutually exclusive. Special thanks to Lillian Stokes for the advice on the camera and to BWD's own Linda Brejwo for greasing the wheels to make it all happen. Male red-bellied woodpecker at our sunflower seed feeder. 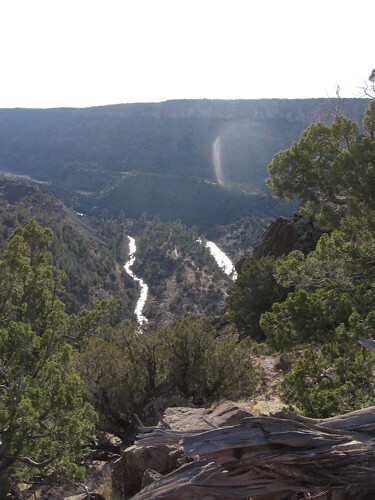 The view from the top of the La Junta gorge. The Red River is on the left, the Rio Grande on the right. 1. We were hiking in a new area. 3. We all felt a bit older. The hiking path we chose was in the Wild Rivers Recreation Area, a nice chunk of Bureau of Land Management land not too far from Taos, NM. The wildlife list includes elk, mountain lions, bobcats, and lots of other interesting critters. We decided to hike the La Junta Campground Trail down to the confluence--a distance of about 1.2 miles and 800 feet in elevation. But those 1.2 miles were on a narrow rocky trail at an angle that made us lily-white woodland dwellers from the East huff and puff. Our mountain goat-like companions live in Boulder, CO, so they had less difficulty with the hike. The upper part of the La Junta trail was well managed with handrails and stairs or ladders for the more challenging bits of descent. We all carried packs with food, water, and extra coats for the kids. Up top, the wind howled around us, giving us a high-desert chill. The more we hiked and the lower we got there was less wind and our exertions warmed us quite thoroughly. Red River, just above where it flows into the Rio Grande. At the bottom, which we reached after about a 70 minute descent, we came upon the narrow flow of the Red River. 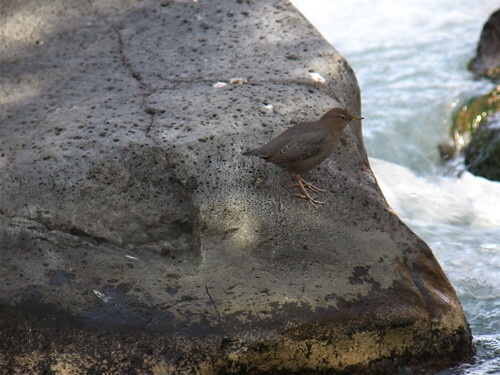 I thought I had heard the metallic calls of the American dipper as we neared the river, but it had been years since my last encounter with this very cool species, so I could not be sure. Once we got to the bottom, we crossed over a small bridge across the Red River. I scanned for dippers, the walked over to the Rio Grande side of the peninsula to scan there. Nada. When I came back, Julie had located the dipper, and we confirmed the call was indeed coming from this feathered swimmer. We both took lots of pix--Julie with her special Shila camera and me with my digiscoping rig. BT3 at the confluence--a spot that really soothed my soul. I hope to go back one day. Check out the rock in the center of this image for the back end of a dipper as it dives. JZ and BT3 at the bridge over the Red River just above the Rio Grande. Photo by Phoebe. My best digiscoped shot of the young dipper. Note the scaly appearance. Adults are solid slate gray. We found it easiest to spot the dippers by their pink legs, which stood out nicely against the gray rocks they perched upon in mid-stream. You can locate the spots favored by the dippers by looking for their white poop on the well-used rocks. We made the ascent in record time and then enjoyed a nice tailgate picnic with flatmeat sandwiches, salty snacks, and a few beers. Quite an adventure, quite a few memories made. Would love to do this every year. I am still a little sore from the hike! It's been ten years since the bird watching world was shocked by the news of the death of Roger Tory Peterson, the man who, more than anyone else, launched the modern era of birding with his simplified approach to bird identification. His first Field Guide to the Birds was published in 1934, and its usefulness made it an immediate best seller. This made it possible to identify birds without having to shoot them. The era of shotgun ornithology was dead. After my parents started Bird Watcher's Digest in our living room in 1978, they sent out complimentary copies of the magazine to various bird clubs, Christmas Count compilers, and newspaper birding columnists. We received an encouraging response in both subscriptions and correspondence, but nothing excited my parents more than the personal letter sent by one Roger Tory Peterson. In his letter, RTP critiqued our first issue, telling what he liked and disliked about it and offering suggestions for the future content direction of the magazine. In the magazine's early years we relied heavily on previously published material (hence the word "digest" in BWD's name). Within just a few years original content created specifically for our magazine began to flood in and BWD evolved beyond the constrictions of being a digest publication, though we still kept our digest size. As the content expanded in scope and quality, my dad took it upon himself to suggest, during a visit with RTP at his Old Lyme, CT home, that he write a regular column for the magazine. My dad never thought Roger would say yes, but he did! From 1984 until his death in 1996, Roger Peterson wrote a bimonthly column for Bird Watcher's Digest, entitled "All Things Reconsidered." Mary Beacom Bowers, BWD's amazing editor from 1979 through 1994, edited those columns for publication. Some of the material was new and original, some of it was updated and re-worked from earlier pieces. But all of it was quintessential RTP. Mary used to remark to me (I was a junior member of the BWD editorial staff at the time) about what a good and careful writer RTP was. His material came in on time and we barely needed to use the editor's red pen on it. In fact writing (or storytelling) may have been Roger's most natural talent. We always considered it our immense good fortune that the great man chose to write for our magazine when there were so many other things vying for his time. This year, to commemorate the 10th anniversary of Roger Tory Peterson's death, Houghton Mifflin has published a collection of Roger's BWD essays, entitled (of course) All Things Reconsidered. I was lucky enough to serve as the book's editor and got to select the 40 most interesting columns from more than 70 that RTP wrote for BWD. It was not an easy job, choosing just 40. Reading through the essays I was reminded of the incredible talent Roger Peterson possessed, and how deeply he felt his connection with birds and nature. Even though I did not write this book, I feel a special connection to it. Roger Peterson is (or should be) a hero to every bird watcher or birder for the legacy he's left to us. I am deeply honored to have my name on the cover of this book, along with the great Roger Tory Peterson. I got to met Roger several times, but our first meeting was the most important. I'll save that story for another post. But if you're really interested in reading about it, it's in the introduction to All Things Reconsidered. Here is some additional information about the book in the BWD online store. The book's publisher, Houghton Mifflin has a few nice things to say about the book. And online giant Amazon.com sells the book and features some recent reviews of it. The legacy of RTP is carried on these days by the Roger Tory Peterson Institute of Natural History in Roger's hometown of Jamestown, New York. Its mission is not only to commemorate America's most important birder/naturalist, but to educate teachers and children about nature, so that tomorrow's Roger Tory Petersons can begin their relationship with nature today. I will be speaking at Peterson Institute on Wednesday, December 6, 2006 as part of the their Distinguished Speakers Series. Details about the program are available here from the RTPI website. The next time you're out bird watching, spend a moment to think about Roger Tory Peterson. And maybe you'll want to smile and whisper a thank you to the memory of the person who changed forever the way we look at and relate to wild birds. It's before dawn and Liam and I have just finished an early soak in the hottub. Now we're watching the sun come up, showing us the direction we'll be heading home. Since we're all packed up I'm hoping to get out to the little patch of desert near the tiniest of creeks where the mountain bluebirds bathe each morning. It's just a few hundred yards up the road. That will be my last bit of birding before we hit the highway. Here's an image of a favorite section of a mountain path in the Wild Rivers Natural Area, just above the confluence of the Red River and Rio Grande in northern NM. May your path always lead upward. May the stones roll out of your passway. And may you reach the top of the mountain while the sun still shines and the golden eagle still soars. Hoping you and yours have an enjoyable Thanksgiving (and lots to be thankful for). Here are a few more images from our Lewis' woodpecker expeditions. We spent about an hour and a half with the colony this morning and confirmed beyond a doubt that these birds rarely sit still for long. It was torture trying to digiscope them. By the time I'd spot one in perched in a spot where there weren't 2.5 million branches in the way, get my scope into position, grab the camera, and turn it on, zoom it to get rid of the vignetting, the bird would have flown to another location. And still, it was a deeply fulfilling experience to spend some quality time with this unusual and uncommon species. One of the quest birds for this trip was the Lewis' woodpecker, first collected by and named for Meriwether Lewis of Lewis and Clark fame. We had a tip that they were findable in Chalma, NM about 90 miles northwest of Taos, but we did not really want to burn a whole day driving to and from there, so I got online and did a Google search for: Lewis' woodpecker, Taos. 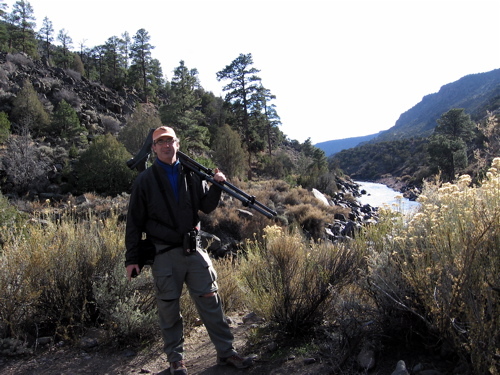 What I got was a link to a local birding guide's website: New Mexico Birdwatching. Ryan Besser of New Mexico Birdwatching was kind enough to give me directions to a local spot where he'd seen the Lewis' about a year ago. I promised to let him know if we found the birds, and to share his contact info with you all via my blog as a thank you for sharing his inside birding info. The Lewis' woodpecker is an odd bird. It's our only pink and green bird. It flies more like a crow than a woodpecker. And it never seems to sit still--constantly flying out in flycatching sorties, shifting positions, scooting from tree to tree. I saw my first and only Lewis' woodpecker years ago in Lucketts, Virginia--a vagrant from the West that stuck around for an entire winter. We lit out from our house about 11 am headed for Arroyo Seco, a small, charming village northeast of Taos. Ryan's directions sent us up to the base of the foothills, along a dirt road. "Stop past the cattle grate and check out the cottonwoods to the right." We did this and saw several starlings and a red-shafted flicker. Oh well, the sighting was a year old and birds have wings after all....at least we tried. Just as we were about to drive farther along the road, I saw a Lewis' perched dead ahead. Zick got her lifer. We high-fived all around and sent massive thank-you vibes to Ryan. Then we noticed that there were at least four Lewis' around the grove of cottonwoods. We got lots of great, if short, looks. Our friends drove up in their car and everyone got at least one scope view of a perched Lewis'. Sometimes these long-shot quests work out just the way you hope they will. Thanks Ryan! And thanks Meriwether! Your woodpecker totally rocks! This morning we're going back so Jules can sketch the birds for a spell. Sorry but this is the only image Blogger would take from me this morning. I'll try to augment this post later, if the Web gods cooperate. We made it Sunday night, after dark, to the house we're renting in Taos with Caroline, Douglas, Hazel & Pearl. It's perched on the northeast side of town in a loose subdivision of rural adobe homes. We're here with great pals and loads of food and adventure ahead of us. We've got at least four Mac laptops for blogging, e-mailing, photo viewing, DVD watching, and music recording. Blogger, well, you may know what's been happening. I am simply not worrying about it. This is, after all, a vacation (four short, blissful days in a completely new landscape, rambling around wherever the wind and sunshine take us). Liam and Hazel playing a game. Since I've been blog-free for a few days, I won't attempt to recount things chronologically. You can check Zick's blog for additional insight and perspective. Caroline's hubby Douglas is the consummate outdoor action figure. He's been a climbing rigger for many movies (Cliffhanger), music videos (Britney Spears), and commercials. He knows, just by looking, how to climb a rock face. Douglas hiking the trail up from La Junta. Their two girls, Hazel and Pearl, are with us, too. Both are musicians--Hazel is a drummer and Pearl plays the guitar. Too bad we have more laptops than guitars. Pearl picking out a tune. I find I am still on eastern time, which means I wake up between 4 and 5 each morning. I have the house to myself for an hour or so before Liam comes padding out, puffy-eyed, to ask for breakfast. It's heaven to me to sit and read my book To the Last Man by Michael Shaara, while I watch the sun reach out to kiss the snowy mountain peaks to the west of us. Those pre-dawn hours are my favorite time of the day--at least until the birding begins. A Townsend's solitaire along the trail to La Junta point. Happy familia at the end of a long hike. Two more birds--the only images that Blogger will take tonight. A black phoebe photographed on Bosque's famous flight deck and a female shoveler who was giving me the hairy eye. It's been a hectic but thoroughly enjoyable couple of days. Today we went to Water Canyon and Magdalena--a richly rewarding trip down memory lane. More on that when Blogger finds its willingness to cooperate. Sorry to make excuses. We've got time but no help from the technical side of things. Tonight we moved across the street in Socorro to the San Miguel Inn--an improvement on our previous lodging. Dinner with J. Bouton tonight at the Socorro Springs Brewery. We gagged down a few beers, just to be polite. Man, I've traveled most of the way across the country, spent the last two days showing birds to people, and Blogger feels this is a good time to go unreliable on me. Asi es la vida. Win some, lose some, life rolls forward. I have come to realize an inner truth on this trip (and it has nada to do with Blogger). My destiny is to roam the Earth in search of birds; then finding them and sharing them with other people. It's a good gig. I like it. And I'm acceptably good at it. Someone once introduced me before a talk I was giving, as "The Pied Piper of Bird Watching." I'm not sure anyone has ever said a nicer thing about me. I willingly accept the scepter. So here we are in Socorro, NM about 30 minutes north of Bosque del Apache NWR. We're taking lots of pictures. We are endeavoring to keep the kids in line. I have gotten up at 4 am the past two days to help lead a field trip called "Black-belt Birding." I have been unabashedly wearing a brown belt throughout the week. The highlights thus far include Julie's amazing keynote last night at the Macey Center in Socorro. We played a bit of music (Side of the Road and Urge for Going, with images) before and after, and Zick rocked the house with her deeply intriguing and painlessly informative program called "Hummingbird Summer." Raves ensued. The other highlight has been watching Phoebe and Liam out in the world, facing new challenges and situations. So far, not much blood, and things are going fairly well. At this very moment, JZ and kids are swimming at Jeff Bouton's hotel while I have ensconced myself in the Socorro Springs brewery (with a wireless connex) so I could catch up on e-mail, BOTB, etc. Since Blogger is either hitting the rocky seas of puberty or the fiery furnace of menopause (or both) I'll just post just a few photos now with hopes for better luck in the coming days. A young bald eagle tries to enjoy a meal of coot while several American crows look on. Red-shafted flickers are very handsome birds! JZ sketched the cooperative flicker while the rest of us sought new birds for the list. Moments later: white-fronted goose. Sandhill cranes over the Bosque at sunset. we realized that we might actually be able to get hired to speak and lead trips at birding festivals. Fast forward to 2006 and we're schlepping through airports with our two children in tow, heading back to the birds of Bosque. Once again Jules is a keynote speaker. I am here to be her personal Geek Squad (to make the presentation run right) and to help lead a couple of birding trips at the refuge. We made it into town and out to the refuge at the end of the day on Tuesday. These western sunsets go on forever, so we soaked it in, watching flights of sandhill cranes come in to roost, lines of waveys (snow geese) over the marshes, and thousands of ducks. Phoebe seems to have taken to birding on this trip. Liam not so much, but we're lucky that there are lots of trains passing by all day long. We hooked up with Leica's own Jeff Bouton who is working the festival. And we ended the day eating green-chile cheeseburgers at the world-famous Owl Bar in San Antonio, NM. Tradition dictates that you must sign or decorate a $1 bill and tack it to the Owl Bar walls. Phoebe, Liam, and Zick all did one. So if you get to the Owl Bar, they are in booth 23 in the back room. It'll be a relaxing week of birding in the high desert. Much needed. Much appreciated. Wish y'all were here. from the album by the same name. The new Edie Brickell & New Bohemians album is sweet. Definitely not the same old dreck we hear so often on the radio. I've always loved Edie B's music. Have had a 'thing' for her, you might say. Something about that Texas accent and the poppiness of her songs. I saw her with the band once back in my Baltimore days in the late 80s. Then she became Mrs. Paul Simon and I lost track of la Edie. It was as though she just evaporated. She re-emerged a year or so ago with a stellar solo album Volcano and now she's back in my regular ear rotation. I'm glad she's still making such great music. And it's pleasing to hear the band is still as tight as ever. Stranger Things starts with a fabulous fuzz guitar riff and gets better from there. Really simple lyrics push things ahead, which is the only way forward. And the minute you get what you want you don't know what you want anymore. And the minute you want to hold on, you let go. . . The entire album is well worth a long listen. Check it out, my peeps. Special thanx to mi amiga fina Lisa for sharing the hot scoop on Edie's latest. I was up before the dawn's early light this morning. Eyes wide open, brain cycling over well-trod ground. There was no hope for a retreat back to the Land of the Sandman, so I decided to step outside into the damp, gray morning air to see who else was up around the farm. The answer was that I could see nothing but I could hear a lot. Hermit thrush whining and tchupping, northern cardinals chipping, American crows mobbing a raptor, white-throated sparrows pinking, eastern towhee chewinking, titmice and Carolina chickadees scolding one another, a white-breasted nuthatch ank-anking, eastern bluebirds burbling, song sparrow chimping, pileated woodpecker laughing maniacally, mourning dove wings whistling, golden-crowned kinglet see-see-seeing, redwing tchaking, downy woodpecker peeking, white-tailed deer snorting, eastern cottontail sneezing, and the sound of the last leaf from the sycamore falling softly into the dewy weeds near the orchard. Nice way to start the day--by 'seeing' with your ears the world waking up. There was no sunset tonight. This is just eye candy for you. Gave my talk to the Lorain County Metro Parks/Black River Audubon Society tonight. Nice bunch of folks who bravely came out on a cold and rainy night. Thanks to Gary and Harriet for making it all happen. Had ants in my pants to drive at least part way home after the show. Made it an hour south to Wooster (where I seem to spend all my Saturday nights of late). Rainy nighttime driving in deer-rutting season is not for the faint of heart. And I was fading fast, so I holed up on the north end of town. The best part of tonight's program was the song I opened with: Far, Far Away by Jeff Tweedy. I played the entire thing with my eyes closed, just feeling the music as it came out of me. It was as peaceful as I've felt in a long time. It was cool (literally) to stand on the Erie lakefront this afternoon, getting blasted by wind and spray. Loads of red-breasted mergs and Bonies. Birding the Lake Erie shore in winter is really a change from what we get in SE Ohio. Of all the bits of time I spent in Cleveland over the years, I sure missed out on a lot of neat people and birdy places. But then I was playing music and visiting friends and birding was lower on the list of priorities. I am not sure there's anything colder than the wet, ripping wind of November, right off of Lake Erie, hitting your face so hard that your eyes water. Makes you feel alive--for a second or two. I want the job of November lifeguard on Lake Erie. Plenty of time for deep thinking (and watching for jaegers).